I GREW UP QUEER in a white working-class North Carolina clan during the 1970s, that moment in history when the backlash to civil rights and feminism and unionism was beginning to gather itself into the regressive forces that became Republicanism and Democratic Clintonism. If I learned anything from the history I would huddle in my room and read obsessively—and later, from the black friends and boyfriends I could not bring home, and from my reporting on the politics and progressive movements of the South—it was this: our only hope for freedom was a radically different future. Emphasis on “radically.” Not the kinds of victories that won legal rights—which labor, African Americans, and women had sort of done, and LBGTQ folks now, sort of, have too. No: the only hope, thin though it was, was in attaining real power. 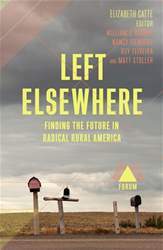 There could be no real progress without destroying the white corporatocracy that passes for democracy—the ultimate victory that the left’s brave and battered standard-bearers, among them those who figure in Elizabeth Catte’s moving essay, have so persistently failed to achieve.